As the day drew to a close Nebula returned back to the den, looking for Athena he quietly approached not wanting to scare her. Lately he was feeling nervous with looking after their batch of eggs he wondered when they would hatch. Yet he couldn't wait to have a family again, Smiling as he spotted Athena "Hey.. you alright?" Athena had been curled around her eggs for quite some time now. She could feel the life emitting from under the hard shells that protected her unborn children. Her terror and unease had been growing every passing day and week. Could she be a good mother? WOULD she be a good mother? Athena had been so scared at the thought if bringing hatchlings into the world. The sound if footsteps caused Athena to sharply look up, her blue eyes widening. She knew it was Nebula though. She smiled, Glad to see her mate. "Yeah, I.. I'm thi nking," she chuckled. Raising a brow he replied as he sat next to her "Thinking? Be careful" sticking his tongue out playfully tapping his tail against her own. "Well I've thought of a name which seems fitting, what about Andromeda for a girl?" smiling waiting for an answer. Athena laughed and curled into him, feeling his beautiful warmth against her icy cold. She closed her eyes, feeling at peace with the world for a second. Her tail, after tapping his tail back, suddenly snatched it. It curled around his playfully and flirtiously. At the name suggestion, Athena cracked open her eyes. "Mm," she hummed in agreemeant. "How about.." Her eyes opened fully. "How about Leona. Leona the second." Her mothers name. Leona FrostClaw. Her stomach went cold at the thought of her disappearance. To get her mind off it, Athena closed her eyes again and spoke. "Nebula for a boy. No questions asked," she teased. Smiling from her suggestion of Leona, nodding in agreement he suddenly blushed as she replied with his own name "Err.... ermm.. I don't think thats a good idea" Nervously smiling he continued "I think Horizon is better" Chuckling licking her chin giving off a soft growl as she pulled him closer by the tail. Using one of his wings to cover her as best as he could, since she was bigger than him it proved difficult. "So how are they? Need some help warming them up?" Athena chuckled. "I was kidding. You're the only Nebula for me," she said, gently cuddling him. She loved him so much. Had she never met him, she'd probably have never fallen in love. The saying, "love is blind," was true. In her eyes, he was perfection. "Horizon? I like it," she said, purring and licking his snout. She chuckled at his growl. "Like that?" She teased. She smiled as he attempted to cover her up with a wing. To make it easier, she kind of burrowed into the ground and cuddled him there, purring loudly. "They're perfect. You can help if you like. I've tried raising my body temperature, but I don't think thats really necessary. Since they have Icewing in their blood, they can withstand my freezing body. But a little heat wouldn't hurt," she chuckled at the last few words. She then turned serious, biting her lip as her smike faded. "Nebby," she said softly. "What if I'm not a good mother? What if I end up hurting them? Killing them? Making a mistake? I've NEVER done anything like this before, and my last encounters with hatchlings went terribly wrong," she sighed, the fear and the worry bubbling within her. She curled around her eggs protectively, shielding them. "I'm not the motherly type. What mother replies to every problem she faces with her claws and teeth?" Nuzzling her snout as she licked it, only to notice her smile to fade. Moving a little closer providing warmth he smiled worryingly and replied "Hey... don't think like that.." stroking a paw against her muzzle, "I believe you will be an amazing mother, with the claws and teeth well its handy for protecting them. Just wait till they join us in this world then you will know..." licking her chin again he continued with a soft growl "Athy you have it in you.. think about it.. your already thinking about protecting them with saying that" sticking his tongue out as his scales colours changed to more of a soft blue aiming to calm her. Athena sighed softly as he spoke, cuddling him gently, while one wing went to rest over her eggs, shielding them from unwanted eyes. Imagine what her uncle could do to her if he knew she had a mate and children. Or unborn children. She could imagine him, picking away bits of the shell, slowly killing her children in front of her while she was chained to the ground..
Athena realised she was shivering and stopped immediately. She went back to listening to Nebula, resting her head on his neck. The growl in his tone caused her half closed eyes to open completely. Her gaze fell to his beautiful blue scales, her body relaxing at the sight of them. "Thank you, Nebby," she whispered. She gave him a kiss on the corner of his mouth, her tongue poking out to briefly caress his lip. "I'll try my best." Sadly Nebula knew about her past well parts of it, so he didn't blame her for thinking that way. Smirking he looked down towards the eggs, suddenly he heard a crack making him gasp with surprise. "Err.. eer..Athena.. I think that time might be now.." looking towards her with a smile, lowering his muzzle to inspect them as he could see one egg with white markings starting to crack. Athena had her eyes closed and was leaning against him when he spoke. A loud crack alerted her. Her head tilted the right way up, her eyes narrowing as she sharply looked down. Quickly, she removed her wing, her jaw dropping into a gape. "Oh my god.." She went as stiff as a board and started to fidget, sniffing them to make sure they weren't being damaged and hatching properly. Terror and excitement took over and she froze, bouncing up and down. She had never been so scared before.. She had fought monsters twice the size of a mountain and she wasn't as scared as she was now. "Come on, little one," she whispered, quietly cheering it on. Smiling patiently he waited for the emerging hatchling, seeing the white hatchling appear from the egg. Gasping he had not seen anything so beautiful in a long time, spotting that it was in fact a she with powerful blue eyes. "Look Athy..." nuzzling her snout, only to realize that another 3 started to hatch. Athena's eyes widened when she saw the hatchling. Just like her.. Athena felt her heart burst in pride when she emerged from the egg. "I'm looking," she whispered. She benther neck till she was at eye level with the hatchling. She gazed at her, eyes wide. "Beautiful." Then she heard another three beginning to hatch. Her head whipped around to look at them all. One of them rattlee furiously, then the top practically exploded. Athena jumped and rushed to peer at the egg. A dark snout emerged from the egg. Athena's breathing hitched. A head that was the image of Nebula appeared from deep within its former shelter. Two hooked wings emerged and clasped the sides of the egg. Then the hatchling hauled itself away from its former shelter. The spitting image of Nebula, stars and all. Except it had glowing blue eyes and blue claws and teeth. It also had a bladed tail. And it had two wings and two legs, like Athena. She. It was another female. Athena gazed at both her daughters, purring without pausing for breath. She sniffed the dark one. "Stunning," she whispered. Smiling happily as he saw another daughter peaking out of an egg he started to help the first one, removing the egg shell revealing the white hatchling. Almost a perfect white, similar to Athena she had a slender build with icy scales with blue eyes. The hatchling already meeping feeling proud he nuzzled the small hatchling. "I think we have found our Andomeda.." still holding the hatchling in his paw. Athena smiled at Nebula as he handled his new daughter with such care. It was like he'd done that before.. She shook the weird thought out of her head. "Andomeda.. Perfect," she purred. She looked at her daughter, and her eyes widened when she saw she was trying to destroy the egg. Of course, being a few seconds old, she could just half gnaw the edges, but Athena knew whose bad temper she'd inherited. She chuckled and helped her, before nuzzling her gently. The dark blue female squeaked and batted at her nose, before clinging to her snout as strongly as a twenty second old hatchling could. The greek goddess of the stars. Very fitting. Athena felt tears sting her eyes as she hugged her daughter very gently. "Nebula, I.. I.." She couldn't describe how she felt. Then the tears came. Spilling down her cheeks. She cried silently and with happiness. They were tears of joy. Raising a brow towards the other female who reminded him of himself, chuckling he replied "Love them? She does look like me" smiling he moved over towards the other two which where hatchling only to spot another similar to himself yet this time pitch black with neon blue eyes. Grinning happily he saw that it was indeed a boy. 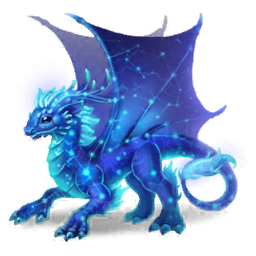 As he helped him out of the shell he gasped as the hatchling breathed out a blue like plasma breath, "Whoa we have a hot one..." Shaking his paw as it took most of the plasma, chuckling he noticed how the young hatchling had blue markings after using the attack. "This one is special" holding it up for Athena to show the markings. Athena grinned. "Shut up." She gently placed her hatchling in between her wings. Asteria peered at her new brother and sister with curiousity. Athena looked at the male, and her eyes widened. "Wow," she whispered. "Amazing!" She squealed, leaning forward and nuzzling her new son. "Handsome boy, aren't you?" She cooed. Another crack caused Athena to look at the second last egg that was due to hatch. It wobbled, then wobbled some more. Finally, it once again exploded the top upwards, the shell cap landing somewhere to be forgotten. Athena giggled. A white head peered out from the shell. Then ducked back in. One red eye, and one blue eye peered out from the darkness, and Athena chuckled softly. "Don't be shy," she said softly. She bent her head and nuzzled the egg. "Come on out." A meep emitted from the egg. Then a head slowly moved out of the shell. Athena was taken aback. It was a snow white male with one red and one blue eye. He looked like a strange albino. The funny thing was the four horns he had on his head were red as well. She looked at Nebula, peered at him for a moment, before she looked at her son again. "How?" She asked. He had feathers too, and they were snowy white. His claws were white too. And his teeth were dark blue, like Nebula's scales. He was very striking, and very handsome, very cuddly looking, but it looked as if all the colours from Nebula had been switched around with Athena's colours. She smiled as the four legged creature crawled the rest of the way out of the egg. And suddenly wriggled its way over to Nebula, trying to cuddle into him. "Awww, like father like son," Athena giggled softly. Asteria meeped and attempted to nip her mother for not giving her attention. Athena smiled and licked her daughter's forehead. "Easy, princess. I love you too." Smiling and picking up the white hatchling, stroking him with his paw giving off a soft growl comforting them. "How about the first male we call Horizon?" nuzzling the other two hatchlings as he replied. Looking towards the last egg he frowned as it wasn't hatching, moving over towards it sniffing incase their was a problem. "Athy... Quick.. put this one back in the warmth"
Athena nodded. "Perfect!" She said softly. The white male stretched his tiny wings and flapped them, cooing. Horizon clung to his father, fear in his eyes as he looked up at him. He was so tall.. Well, at least, to Horizon. Athena chuckled. Then she too noticed the egg. She nodded and quickly curled around the egg. A panic was in her eyes as she tried to warm her own temperature, but it was very hard. Asteria and Horizon both stared at the lifeless egg, frozen in place. The two looked at their father, then their mother, who had gone silver in the face, her own version of "extremely pale." Andromeda moved along ontop of his head, holding tightly the best she could, chuckling as Nebula spotted her. Using his warmth to help Athena he laid to the side of the egg, deciding to use some of his starfire. "Watch out.." blasting a small amount towards the ground next to the egg. With the ground heated he spotted the egg twitch, smiling he nuzzled Athena "There.. we have a lazy one" he teased as he watched the egg crack slightly. Athena jumped as Nebula blasted his starfire. Horizon whimpered and darted off, hiding behind his mother's other wing. Asteria though, crouched, letting our a high pitched hiss. Athena had to laugh at her daughter. Athena returned the nuzzle, relief flooding her eyes. "Just like you then, you big teddy," she teased, kissing him softly. Asteria and Horizon, not understanding why their lips were hugging, pulled confused expressions. Nevertheless, an amused Athena broke the contact and joined him in watching the final egg hatch. She wa fidgeting in excitement! As the egg started to break away Nebula lowered his muzzle to greet the small one, his blue eyes gazing over he saw a head poke through a small gap in the egg. Instantly he smiled almost like his jaw dropped, "Oh my .. Athena.." Using his paws to clear away the egg his first inspection was correct, a pure starwing with a hint of ice. She was almost perfect for much like her brothers and sisters, with a mix of blue and white nebula pattern, black eyes to match yet they had stars. Lifting her up with his paws moving her towards Athena, "Say hi to your mother little one"
Athena was gently grooming Asteria and Horizon, preening their feathers, when Nebula said her name. Athena stopped mid-lick and raised her head. She raised a brow, wondering what had him so amazed. Well, it was his new child, but.. What was it? She got her answer soon enough. Athena's eyes went as wide as saucers. "She looks like me.. When I'm.. In my ice form," she whispered. Overwhelmed Athena sniffed her daughter, before nuzzling her. She was a mother. An offical first time mother. A PROPER mother. She looked at them all now, and wanted to protect them so badly. Just then, Horizon squealed, demanding food. Athena blinked and sighed softly. Here we go. "Will I go hunt and you watch the hatchlings?" She asked her mate, looking at him with her icy eyes. Nodding towards Athena, "Well you are a better hunter than me" chuckling he looked towards his kids, smiling wrapping around them watching. Though he did notice that some of them wanted to follow Athena, holding them back gently with his paw he replied "Stay here guys..Your mother will be back soon"